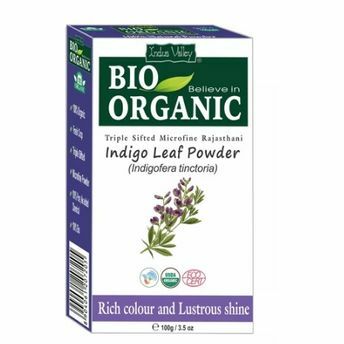 Indus Valley Bio Organic Indigo Powder contains Indigo Leaves which gives dark burgundy colour to hair & enhances the Natural colour of hair. It also works as hair treatment & prevents hair fall, dandruff rejuvenates hair and makes them shiny. This Powder is microfine triple sifted and gives a great color. Indus Valley Bio Organic Red Henna Powder is an organic red henna powder that gives your hair the healthiest henna color ensuring grey coverage and health of your hair simultaneously. With the presence of natural herbs like Henna, Amla, Shikakai, Brahmi, reetha, tulsi, fenugreek, bhringraj and colourless henna, it helps out to enhance your hair's health and also aids to protect it from hair related complains like dandruff, itchy skin etc. Indus Valley BIO Organic henna is 100% plant material and completely chemical free: no metallic salts, no ammonia, no PPD!